LOS ANGELES – IMAX Corporation (NYSE:IMAX) today announced that Marvel Studios’ Black Panther pounced into IMAX® theatres with a record-setting $35 million four-day global debut on 676 screens (excluding China), making it the largest opening ever for an IMAX release in February. 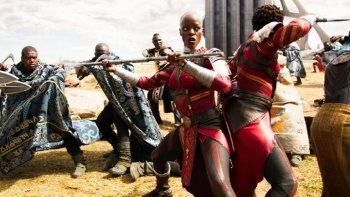 Domestically, Black Panther set a new February and Marvel IMAX record, grossing $23.5 million in four days on 404 IMAX domestic screens. While Black Panther dominated the global box office, three local-language titles took center stage in China during the Chinese New Year four-day period. Detective China Town 2, Monster Hunt 2 and Operation Red Sea shared IMAX screens and generated a combined record $18 million –representing a 60 percent increase in IMAX box office over last year’s holiday period. In total, IMAX posted a combined global box office of $53 million over the four-day period, marking the second-highest-grossing weekend in the Company’s history.